Canine osteoarthritis is a chronic degenerative disease that affects one or more joints in the body. Dogs affected by osteoarthritis often have pain and stiffness that affects their mobility and overall quality of life. There is no cure for osteoarthritis. However, there are many ways to treat the disease. Some forms of the degenerative joint disease, such as hip dysplasia, can be treated with surgery. However, the majority of osteoarthritis cases must be managed in other ways. In general, the focus is on lessening discomfort and slowing the disease progression. In most situations, it is best to approach the management of osteoarthritis from multiple directions. Success depends on the severity of the disease and the individual response of each pet. It is essential that you communicate with your vet about your dog's condition. Often, combinations of all or some of the following therapies are recommended. Non-steroidal anti-inflammatories (NSAIDs) are commonly used to bring down inflammation, decreasing pain and stiffness. Common brands of veterinary NSAIDs are Rimadyl, Deramaxx, Previcox, and Metacam. Corticosteroids like prednisone or dexamethasone may be used instead of NSAIDs. However, this method of treatment is not very common, as the long-term effects of steroid use tend to be more serious than with NSAIDs. Corticosteroids should never be given in conjunction with NSAIDs, as serious gastrointestinal damage may occur. Analgesics like gabapentin or tramadol may help to relieve pain but are not anti-inflammatory drugs. Your vet might prescribe these in conjunction with a NSAID, which is generally considered safe to do. Adequan injections are sometimes given in addition to one or more of the above treatments. Adequan is polysulfated glycosaminoglycan made from the cartilage of cattle. According to the product website, Adequan "helps prevent the cartilage in your dog’s joint from wearing away. It helps keep the cartilage healthy and intact so that the bone in the joint cannot touch other bones." Many vets and owners can attest to the effectiveness of Adequan treatment. There are a variety of supplements on the market that are available over-the-counter and can help support an arthritis treatment plan. These products will not ease the acute pain but work slowly to ease discomfort and slow disease progression. Fortunately, these supplements do not pose the same risks to dogs as the above prescription medications. Be sure to discuss the best combination of treatments with your vet before beginning. The most commonly recommended supplements include glucosamine/chondroitin, MSM, and omega three fatty acids. Acupuncture involves the therapeutic use of the tiny needle in specific points on the body. This can be an extremely effective treatment for a number of diseases, and arthritis is no exception. Positive results from acupuncture are often seen right away and can increase with ongoing therapy. Veterinary acupuncture should be performed by a Doctor of Veterinary Medicine who is certified in veterinary acupuncture. There are numerous herbs and homeopathic treatments available to support arthritic patients. Traditional Chinese veterinary medicine (TCVM) can be especially helpful. Many owners have seen positive results with these therapies, but results are typically subtle and sometimes only recognized after long-term use. The best news about alternative therapies is that they are typically safe for pets with other health problems and have fewer, if any, side effects. If you are interested in finding an alternative vet, acupuncturist or TCVM practitioner in your area, visit The Chi Institute online. 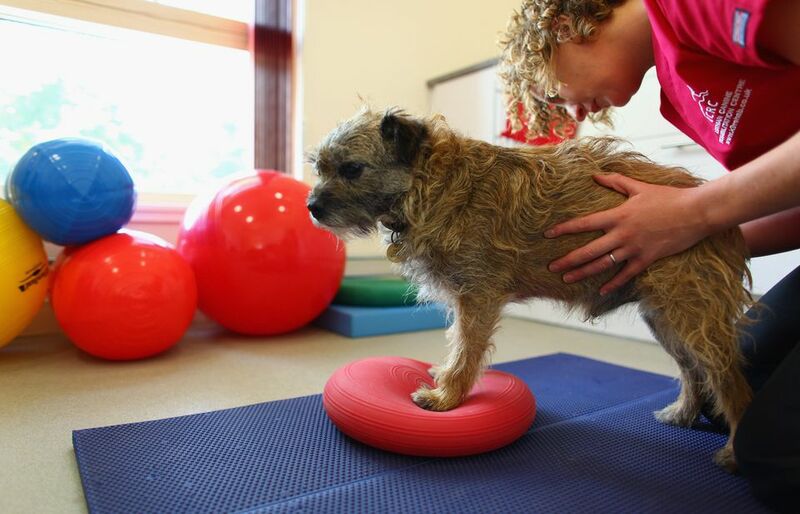 Physical therapy and rehabilitation can work wonders for your arthritic pet. There are many forms of physical therapy you can even do at home if you know how. Ideally, you should first visit a Certified Canine Rehabilitation Practitioner or Therapist (CCRP or CCRT) to have your pet evaluated for physical therapy. Modalities include water therapy (via underwater treadmill or resistance pool), exercises to promote strength and range of motion, stretching and massage. Your pet's therapist can recommend a treatment plan that will work best for you and your dog. In addition to medications and supplements, you can help your arthritic dog by making some specific changes to his environment and lifestyle. Many of the changes you make will be of little or no cost to you. By making some adjustments, you can help your dog live a happier and healthier life. Arthritis treatments can slow the progression of the disease, but your dog's symptoms may continue to progress. Eventually, they may become so severe that your dog can no longer be helped. Sadly, when other options have been exhausted, the time may come to consider humane euthanasia. As difficult as this decision is, know that you will be doing the right thing. Until that day comes, do the best you can for your dog with arthritis: work with your vet, take some time to understand arthritis, add medications and supplements as needed, consider alternative therapies, and change your dog's lifestyle and the environment. Your dog will thank you! What is Myasthenia Gravis and How Does it Affect Dogs? Could My Dog Have Hip Dysplasia? Does Your Dog Have Gum Disease?